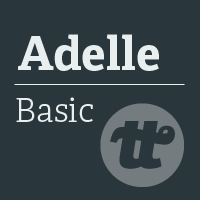 Adelle basic can be defined as a slab serif typeface. It was devised specifically for intensive editorial use. The primary usage was meant to be in newspapers and magazines. The overall personality and flexibility of the typeface makes it a real multiple-purpose font. The transitional weights contribute to a highly legible and neutral look when utilized in a wide range of text sizes. It is an ideal fit font for newspapers due to its typical robustness. The inconspicuous look of the lettering, first-rate surface and to some extent dark colour allows it to act impeccably in incessant text setting. It can even work for the most demanding editorial applications.